"BLECH - it's horrible! Why would anyone do this?!" It may not have quite gone like that but this was very much the sentiment when I tried my first few Black Saisons. I just didn't get them and thought the roasted notes from the dark malts did nothing for the lovely Saison yeast esters, often tasting like burnt rubber and other nasty things you wouldn't want a beer to taste like. My love of Saison as a style is well documented on this blog and I've certainly drunk my way through many of them. Black Saison seemed initially a stretch too far for my palate and it took a very special beer to finally tune in. That beer was Dieu Du Ciel's ISSEKI NICHO, described as a 'hybrid between an Imperial Stout and a Belgian Saison'. Having sampled and failed to get my head around offerings from Green Flash/St Feuillien (Friendship Brew), Magic Rock/To Ol (The Juggler) Marble/James Kemp (Emancipation) and others, which as you'd expect from such brewers were perfectly brewed beers, I didn't hold out much hope of ever enjoying one. However, as my wife Jane sat there grinning at her glass having ordered a 1/3rd on keg at Brewdog Shepherd's Bush I couldn't help but pinch a sample (it's good to share and she's great at picking out corking beers!). I didn't know what style it was from the name and as I sniffed, swirled and sipped, something just fell into place. Was it a stout? It was definitely 'Belgian'? What are those spices in there? It was a beer to think about, certainly. It's fair to say I absolutely loved it and on the next round ordered a glass to myself (no need to share this one of course!) and mentally tried to deconstruct what was in the glass. "It's like a herby black Belgian Imperial Stout", I declared. A quick google later and HORROR - "It's a Black Saison and I hate Black Saisons. They're JUST WRONG!". It's fair to say that was something of a u-turn moment. 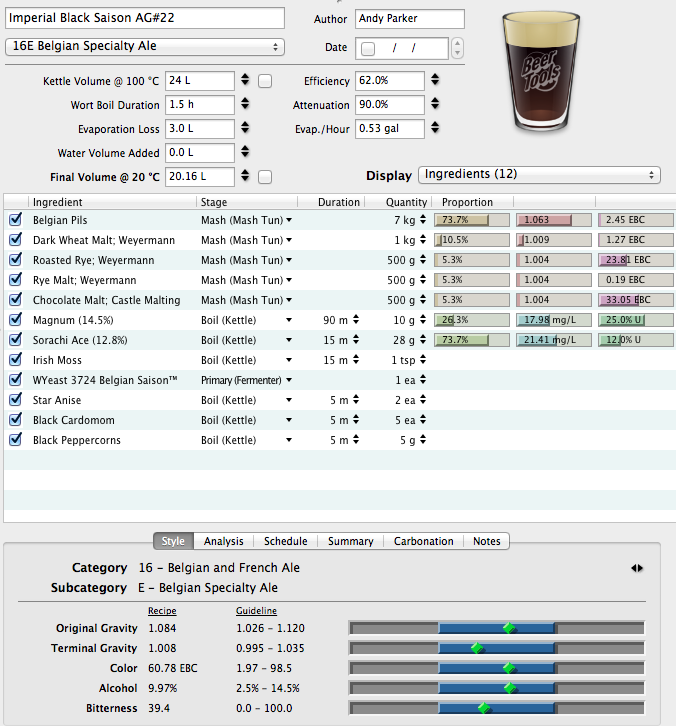 I now wish I could go back and re-try those other brews I'd so hastily written off on first sample. It's a very dark grist and I selected both regular and roasted Rye malts to really bring some of that wonderful spicy bite Rye can impart. Beyond that, Dark Wheat and Chocolate were selected as I'd used them in big stouts before to some success. Magnum for bittering and Sorachi Ace for an added flavour twist (two brews in a row - woah!) and finally a trio of deep dark spices - Star Anise, the Black Cardomom and some pepper. The yeast choice to me was the easiest part of the recipe, especially now I have a heating plate to play with and can get my FV up near 30 degrees, to hopefully avoid the 1.030 stall that the DuPont yeast is known for at ale fermenting temperatures. As I write, the beer is fermenting away and the yeast is tearing through wort which started out at 1.084. If it heads down near 1.008 as I hope it will, this'll be a beastly 10% ABV, black as night balls out Imperial Black Saison. If it's half the beer ISSEKI NICHO is, I'll be one very happy brewer!